Finally, a spotlight that shines exactly where you need it. Do you ever get in the way of the light while detailing? The Brinkmann LED Headlamp ensures that won't happen. The Brinkmann LED Headlamp shines wherever you are looking and it's hands-free. Durable construction and an LED bulb that never needs replacing make the Brinkmann LED Headlamp an invaluable helper for any job. If you cast shadows while you're trying to detail or repair your vehicle, it's time to get the Brinkmann LED Headlamp. It fits comfortably on your head and provides bright light wherever you need it. It's impossible to hold a flashlight while detailing or working. The Brinkmann LED Headlamp is totally hands-free. Use the Brinkmann Head Lamp to perform maintenance on hard-to-see areas. 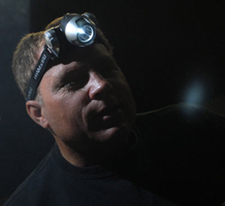 The Brinkmann LED Headlamp should be a part of your emergency kit you carry in your vehicle. 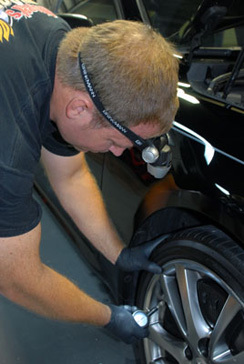 If you have to change a flat tire at night, the Brinkmann LED Headlamp will provide a hands-free light source. Get the tire changed and get back on the road faster. the paint while you detail. In addition to detailing, the Brinkmann LED Headlamp is ideal for auto and motorcycle repair, paint chip repair, fine woodworking or painting, or any job that requires extra light to get it done right.